Yesterday I attended the Sapphire Stigma Summit where he was pleased to be able to listen to talks about stigma, discrimination and other aspects of mental health. 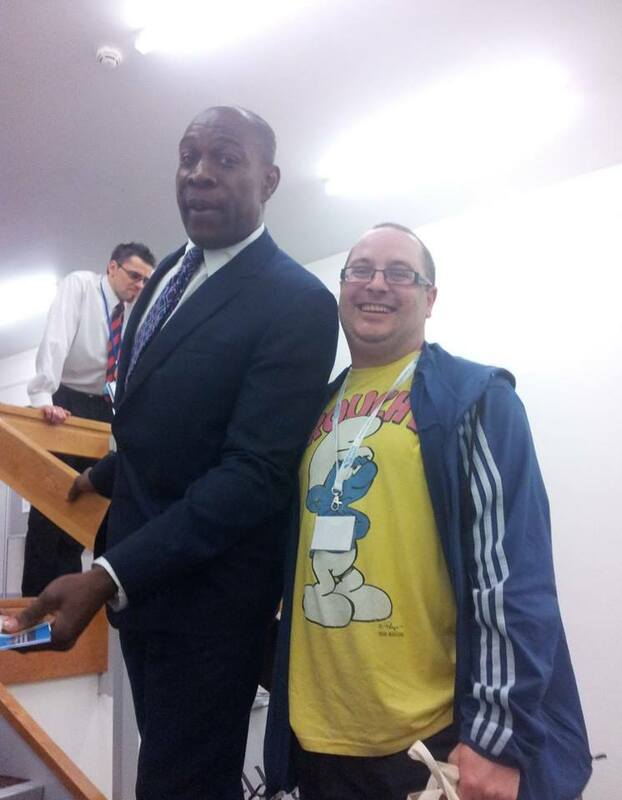 Along the speakers were Frank Bruno and Clarke Carlisle. I have a lot of time for Clarke as he is a professional footballer but is also speaking out about depression in football, something that people have little sympathy for due to the wages that the players earn and how out of touch with the real world some of them appear to be. Of course depression couldn’t care less about your colour, gender, income and any other aspects of your lifestyle but I do often see a lack of sympathy for the rich and famous because of their money, that they are somehow immune to mental health illnesses. 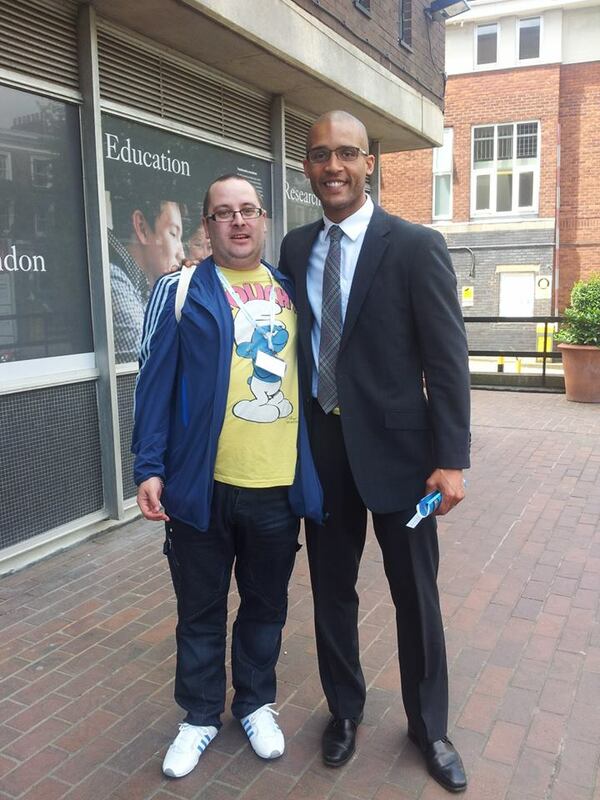 During my little chat with Clarke Carlisle I told him that I was preparing to come off my medication and he was concerned about the timing, as I know a few people are as well so please let me explain the reasoning behind my decision so you don’t have to worry. The fact is I no longer feel depressed! I wake up each morning at 7 looking forward to the day and what it may bring, knowing that I will be heading out to the gym or even just going out for a walk because I want to get out and about. I am no longer the hermit I had become always wanting to be close to home and my bed! I have started doing things again that I hadn’t done in years – I want to go out socialising and meeting new people, reconnecting with friends again and even searching for work again! I have NEVER felt this strong mentally despite the emotional upheaval of the past month or so and I know that I will never allow myself to fall into the clutches of the black dog again. In fact the last time it came near me I growled back and it soon went running. I have been to hell and back the last 3 years especially and have survived through all the dark times and emerged a better person on the other side, fitter and stronger both physically and mentally and the time is right now for me to continue this journey medication free safe in the knowledge that things will never be that bad again. Stubbornness can be a nightmare at times but not when it comes to me and my mental health! I survived 4 years of depression without meds before finally seeking help and can do so again believe me. My days are now spent proactively and productively not wallowing waiting for sleep to take over me again. I have settled down into a good sleeping routine so no longer am I too tired to fight off the thoughts and fears that depression can bring. I have more energy and motivation these days in small part due to my wonderful kids especially Brandon. our relationship has been amazing again through all thats been going on and they need the strong Garry to remain to show them that no matter how hard life can be you never give up fighting. I am all too aware of the battle ahead and that there may be times when I feel depressed again in the future, it is like giving up drinking sometimes you can fall of the wagon, but with this new attitude towards life and strength there is nothing I can’t face head on now and defeat. What I have been going through recently is a mixture of different emotions and feelings that are natural to my current situation and not depressive reactions like feelings of failure and suicide and when I do get a bad spell these last hours rather than days! I just simply dust myself off and start again. So please don’t worry about the moose instead worry about the rest of the world as I make up for lost time and attack the future all guns blazing! That’s awesome – both about the blog being read and you feeling better 🙂 I don’t want to sound like your Dad or your doctor, but be careful, okay? You know yourself better than anyone, so please look after yourself.